The Berkeley Street Theatre–Courtyard, Toronto, Ont. A fine production of a gripping play that puts the audience in the middle of a harrowing journey to freedom, as they sit in a 20 foot shipping container with refugees desperate to escape their countries. The Story. Five refugees, fleeing their war-torn countries (Somalia, Turkey, and Afghanistan), have paid a lot of money to be taken to England. They have all made circuitous journeys to find themselves in a 20 foot long shipping container that is taking them by truck to what they hope is freedom in England. Fatima is from Somalia. She is travelling with Asha, a fifteen year old. Fatima is referred to as Asha’s mother or aunt. She is neither. Jemal is a Kurd from Turkey who has tried three times to get to London to see his girlfriend and their baby. Ahmad is a ‘businessman’ from Afghanistan. Mariam is a young widow from Afghanistan. There is a sixth person, the Agent who is co-ordinating this journey with the truck driver. The Agent is from Turkey. The five refugees keep their distance from each other. They don’t trust each other and the stakes are too high to give too much information away about themselves. Then the Agent comes in the container to tell them that the driver wants $50 more for the journey or he doesn’t go another step. Generally they don’t have it. The manoeuvring, negotiating and minutiae of how they shift and vary their stories is fascinating. The truck moves on. Will they get caught? Will they reach their destination? The Production. The audience files into the 20 foot long container in the Courtyard of the Berkeley Street Theatre. They sit on a bench along each long side of the container. A blanket on a hook hangs down in a corner. This is where the characters would go to relieve themselves. They draw the blanket around them for privacy but we hear everything. The audience is also joined by four of the five refugees. Fatimah and Asha wear long flowing robes. Their heads are covered but not their faces. Jemal is in well-worn jeans. Ahmad is in traditional tanned coloured pants, top and sandals. Miriam is let into the container at the last minute. She also dresses in a flowing robe with her head covered. The Agent wears pants, trainers, a zipped top and many, many bracelets. The refugees sit amongst us or navigate the space. Director Zachary Florence negotiates the action around that small space for maximum dramatic affect without compromising the audience even thought they are right in the middle of the action. The clanging sound of the container door being unlocked is quite startling, as is the sound of it banging shut. 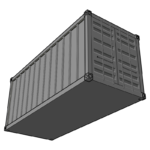 The only light in the container is supplied by flashlights held by the characters. Nick Carney’s sound design is terrific. There is ambient sound of what is happening outside. We hear the truck starting and revving up. There are occasional startling sounds of banging outside which can be alarming to the refugees. To be nit picky what is missing is the sense of movement and rocking of the container on the truck. Short of having people outside the container pushing on the walls to give it a sense of movement for the hour of the performance, imagining the movement will do. The cast is exemplary showing a group of people coping in extraordinary circumstances. As Fatima, Bola Aiyeola is reprising the role she played in the Summerworks 2014 production of The Container. Fatima is secretive and determined. As her ward of sorts, Asha, Ubah Guled is watchful and perceptive. For one so young she can size up people and situations. Guled gives an accomplished performance—she is one to watch for one so young. Victor Ertmanis plays Ahmad as an irascible, irritated man who has to travel with people he deems beneath him and since he is consistent in saying he’s a ‘businessman’ one can understand his irritation. As Jemal, Adriano Sobretodo Jr. is properly excitable, in control and in the end, desperate to see his girlfriend and daughter. This is a man who does not give up, no matter how bad the odds. Mariam has many secrets and Lara Arabian plays her with heightened emotion. She is a character who has much to lose and hide. And finally Constantine Karzis plays the Agent with swagger, confidence, arrogance and a wonderful sense of the bluffer. This terrific cast makes the play sizzle. Comment. The Container was first produced in England 10 years ago. It was first produced in Toronto as part of Summerworks 2014, where I saw it and was bowled over. Ditto with this production. The audience is assured that while it will be hot in the container, there is ventilation. The audience is given bottles of water. They are told that if they have to leave they just have to stand up and someone will lead them out of the container. Every effort is made to make the audience feel safe. But of course the audience has a vivid imagination. It’s hot in there. The refugees are desperate to get to another country for safe haven and therefore they are desperate to get out of the container and end the uncertainty. The audience feels that desperation and perhaps even a bit of their own. Playwright Clare Bayley has written a tight, gripping play about surviving in terrible circumstances. She has focused on the human stories and how such incidents affect a person. It illuminates how even the youngest refugee must be wily and cunning. The audience is always guessing who is telling the truth and who is not and does it matter, considering what these people have endured. And while each character is out for him/herself, Bayley has written a play full of humanity and kindness. In light of the Syrian refugee situation that has been filling our newspapers for months and the galvanizing effect it’s had on Canada and the rest of the world, The Container is a sobering, unsettling play that is so timely, alas. First performance: Sept. 4, 2016. Cast: 6; 3 men, 3 women.